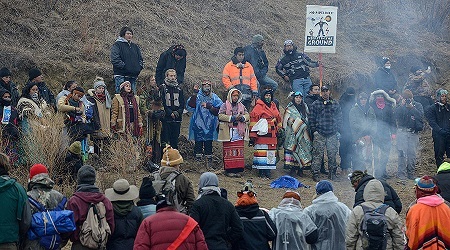 The U.S. Army Corps of Engineers announced it will close the portion of federal land on which water protectors are camping in North Dakota by December 5, to protect the public amid violent confrontations between protesters and law enforcement. The Army Corps of Engineers said it is “closing the portion of the Corps-managed federal property north of the Cannonball River to all public use and access effective 5 December, 2016,” according to a statement tweeted by the Young Turks` Jordan Chariton. Standing Rock Sioux Tribe responded to the notice expressing how deeply disappointed they were. The notice comes a week after 26 people were injured and taken to hospital during classes at the pipeline site last Sunday and more than 200 were reportedly treated for hypothermia after Morton County Sheriff’s Department deployed water cannon in below-freezing temperatures. Photo: Protesters participate in a prayer circle on Turtle Island on Thanksgiving Day during a protest against plans to pass the Dakota Access pipeline near the Standing Rock Indian Reservation, near Cannon Ball, North Dakota, USA, 24 November 2016. Source: Stephanie Keith / Reuters.